Office – where do we go from here? The 293,000m2 of vacant office space in Ljubljana comprises approximately 235,000m2 of older space and 58,000m2 of new build. Companies going out of business, downsizing, and rental of previously vacant office space are all contributing to the large amount of available space. The total occupied space is estimated to be 660,000m2, so the vacancy rate, at 30%, is high. Where will demand come from for all this office space? Demand for office space comes from three sources; lease expiries, economic growth, and foreign direct investment. It is difficult to estimate how much space will be taken up each year as a result of lease expiries for two reasons. First there is no record of the percentage of owner occupied space, however a recent survey indicates that approximately 50% is owner occupied, and 50% leased. Second, many companies have indefinite leases, so whilst they can move at any time subject to the appropriate notice being served, they have no incentive to move at a given time, as their lease has no expiry date. Nonetheless, we estimate that lease expiries will result in 26,000m2 of take-up each year. 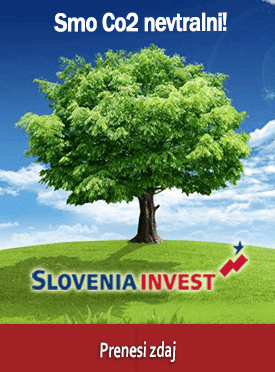 It is hard for most people in Slovenia to imagine economic growth at present because of continuing poor business sentiment. However, Oxford Economic Forecasts estimate that within Ljubljana, there will be an increase of up to 5,642 employees in office based employment sectors over the next five years, and that will create demand for new space. Slovenia has to date attracted limited Foreign Direct Investment, although a recovery in volumes was seen from 2006 to 2008 until the global economic downturn impacted on FDI activity, not only in Slovenia but globally.A steady upturn in interest is anticipated over the next few years, albeit still below peak levels seen in 2002, with an estimated US$1.2 billion anticipated to be invested in the country this year.Most FDI has come from wholesale and retailers, who accounted for over 40% of companies into Slovenia, whilst manufacturing companies showed consistent activity levels of around 15%. Because of the profile of FDI in Slovenia, it is unlikely to create significant demand for office space in the near future. Cushman and Wakefield, a global property advisory, estimates that overall take-up will be around 40,000 m2 per annum in Ljubljana for the next five years, based on available information. With little new demand for space, it is clear that take up will be primarily from Companies relocating from older, outdated office space. This is good news for the landlords of the new office buildings, but very bad news for those who own the older ones. There is around 60,000m2 of office space available for rent in new buildings, and with 40,000m2 of take up each year, the vacant space is likely to fill up within the next two years. Rents in such buildings have dropped and it is now possible to move into a brand new building for as little as 11€/m2, by taking a large space and signing a long lease. Some new buildings are still overpriced, but landlords will find it impossible to rent the space until they accept market levels. Average rents are unlikely to drop much more in new buildings but clearly competition will become much more fierce in older buildings. With 235,000m2 currently available and more to come we can anticipate a steep drop in rents. Landlords in new buildings are becoming much more competitive, and have started offering a free rent period and a free fit-out, allowing occupiers to take advantage of cost neutral and cash neutral moves. Quarters 1 and 2 saw little office market activity in Ljubljana but there was a big increase in Quarter 3, and Quarter 4 shows no signs of slowing down. Many Companies have realized that this is an unprecedented time for negotiating a good deal for the next 5 years. Achievable rents tend to be approximately 10% lower than advertised prices. Up to 15% common space is generally charged in addition to rent, as are service charges, water, electricity and VAT. What about the pipeline projects? A cohesive central business district has never developed in Ljubljana unfortunately. Dunajskacan best be described as the CBD but it is a very long street, and home to many other buildings, not only office towers. Some Companies that one would expect to find in prestigious offices in the City Center are located in inferior locations. This is certainly partly due to the poor availability of office space in 2004 when an influx of new companies arrived in Slovenia thanks to EU accession; and the poor supply of office projects coming to market between 2001 and 2008. There is a large project pipeline, but it is not clear how many developments will come to market in the short term due to the current oversupply of space and difficulties in obtainingbank finance. The city center can support one new quality office building, and it will be interesting to see which project gets to market first, there are three contenders; Immorent’s City Tower, Tri Granit’s Emonika, and the S1 project, currently in the hands of the liquidator. Slovenia entered recession after northern and western Europe, and the country is still lagging behind in recovery. Although production and exports have increased significantly, the construction sector and other business sectors are still in crisis. For reasons of sentiment, achieving an affordable rent is the number one priority for Companies and Organizations wishing to relocate. Rent has replaced location as the number one objective. The second priority is availability of parking. Occupiers want a limited number of secure parking spaces for Directors, and availability of free parking within walking distance for Employees. Pay per hour parking for visitors is also desirable.